Letter to Mrs. Martha Cooke of Sandusky, Ohio from M. L. M. O'Neil of Worthington, Ohio from the collections of the Worthington Historical Society (WHS) may be used for educational purposes as long as it is not altered in any way and proper credit is given: "Courtesy of the Worthington Historical Society, Worthington, OH." Prior written permission of the WHS is required for any other use of Letter to Mrs. Martha Cooke of Sandusky, Ohio from M. L. M. O'Neil of Worthington, Ohio. Contact WHS at info@worthingtonhistory.org to request permission. Letter to Mrs. Martha Cooke of Sandusky, Ohio from M. L. M. O'Neil of Worthington, Ohio is text, with genre letter and correspondence. Its dimensions are 11 in. x 8.5 in.. It was created on Thursday, October 11, 1838. 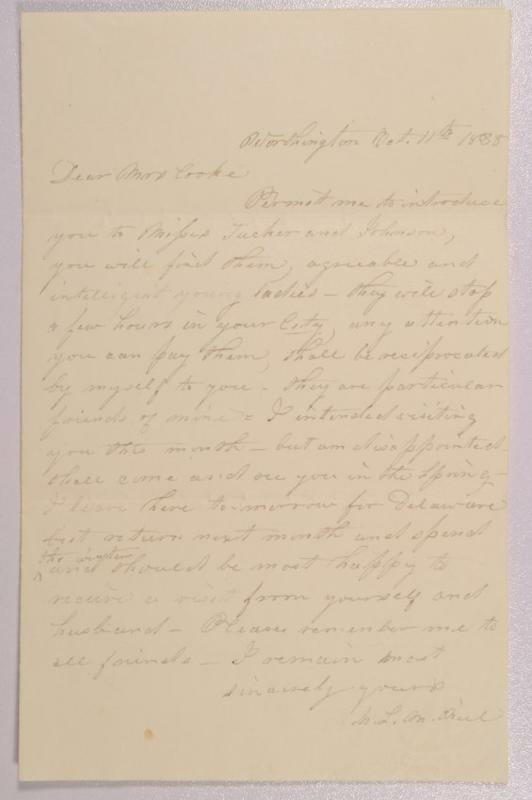 In this letter, Ms. O'Neil of Worthington, Ohio is introducing Misses Tucker and Johnson (Mary Johnson) to Martha Cooke of Sandusky, Ohio as a courtesy. The two ladies are traveling north, perhaps changing stages en route to Milan to visit Mary's brother William Johnson. Ms. O'Neil vouches for the ladies' character and asks her acquaintance to give them "any attention you can pay to them" during their time in Sandusky. William H. Johnson was Mary's brother. He was born in 1818 and died in 1840. It covers the topics Worthington history, history and Orange Johnson House. The Worthington Historical Society identification code is 2012.0005.86. The Worthington Memory identification code is whs0998. This metadata record was human prepared by Worthington Libraries on August 25, 2017. It was last updated October 13, 2017.